Attention ADHTM, DHTM, DHO students! Do you aspire to be an ANALYTICS PROFESSIONAL? We have a brand new course available for those who are interested! HIFIA is a professional course completion that is a notch under the CHIA (Certification in Hotel Industry Analytics) which in turn is the only hotel-related certification for industry professionals focused on analytics. HIFIA is targeted at two-year programme schools, vocational institutions and colleges in developing areas of the world. It is a thorough introduction to the math required by a hotel or tourism industry professional, the reports used in the hotel and tourism industry and to the analytic skills used by industry professionals. The HIFIA helps students understand that the math required by a hotel or tourism industry professional is not “rocket science”. It also helps students appreciate that the hotel and tourism industry relies heavily upon data and the ability to analyse that data. An abridged version of the CHIA, the HIFIA has less of an emphasis on math, reports and analyzing data, but it still builds a solid foundation on the basis of hotel industry analytics. 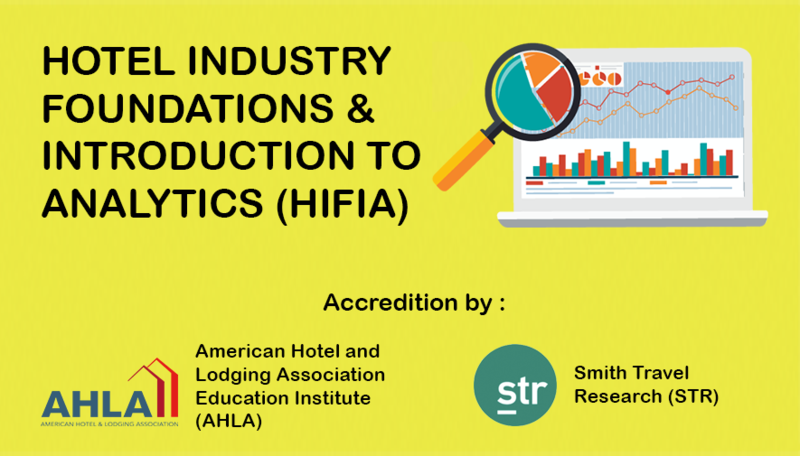 HIFIA is jointly offered by the American Hotel &amp; Lodging Association through its education arm AHLEI (AHLEI, AHLA) and the Smith Travel Research (STR) – both based in the United States of America (USA). Since 2012, nearly 3,000 students and professors have received the HIFIA and CHIA certifications.Singapore hotels subscribe to STR reports. SDH Institute students and graduates with the HIFIA course completion are among the few in the local hospitality industry today who are differentiating themselves. With the HIFIA professional course combined with your SDH Institute qualification, you transform into a strong hospitality professional and future industry leader.